Once your purchase is complete, your personal course purchases can be accessed from your "My Courses" page for 12 months from date of purchase unless specifically stated otherwise. You must be logged in to this site to use your online courses. No shipping is required for these purchases. What discounts are available for my purchase? The final checkout price of your purchase can be reduced by the application of a valid coupon code or automatically applied volume discounts. This site will automatically adjust your final cost to reflect any volume discounts. 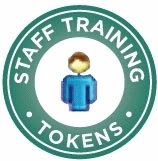 These are particularly important to customers who purchased bulk tokens for their staff. Volume discounts are subject to change.